Zaca Mesa’s Homage Collection of wines includes this sauvignon blanc from McGinley Vineyard in Happy Canyon of Santa Barbara. “East to West” Revisted:” The vast Santa Ynez Valley appellation encompasses two smaller AVAs: Happy Canyon of Santa Barbara to the east, and the Sta. Rita Hills to the west. At the east end, various Bordeaux grapes thrive in the heat; on the west end, it’s all about pinot noir and chardonnay, which flourish in the fog. 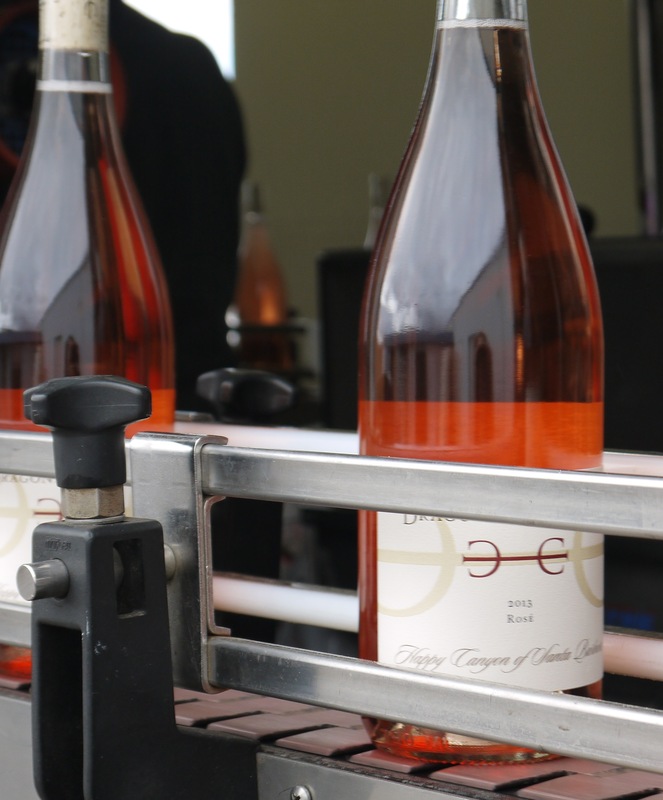 The grenache, mourvedre and syrah grapes harvested from Vogelzang Vineyard last September now comprise the 2013 Rosé, Happy Canyon of Santa Barbara. Dragonette’s owner/winemakers released the wine just last week, said Brandon Sparks-Gillis, co-owner with his wife, Michelle. Brothers Steve and John Dragonette and their wives, Jen Hart and Mitchi Dragonette, respectively, round out the team of owners. The three couples collaborate to carry out all of the winemaking, and most of the marketing and sales of the winery, based in Buellton. 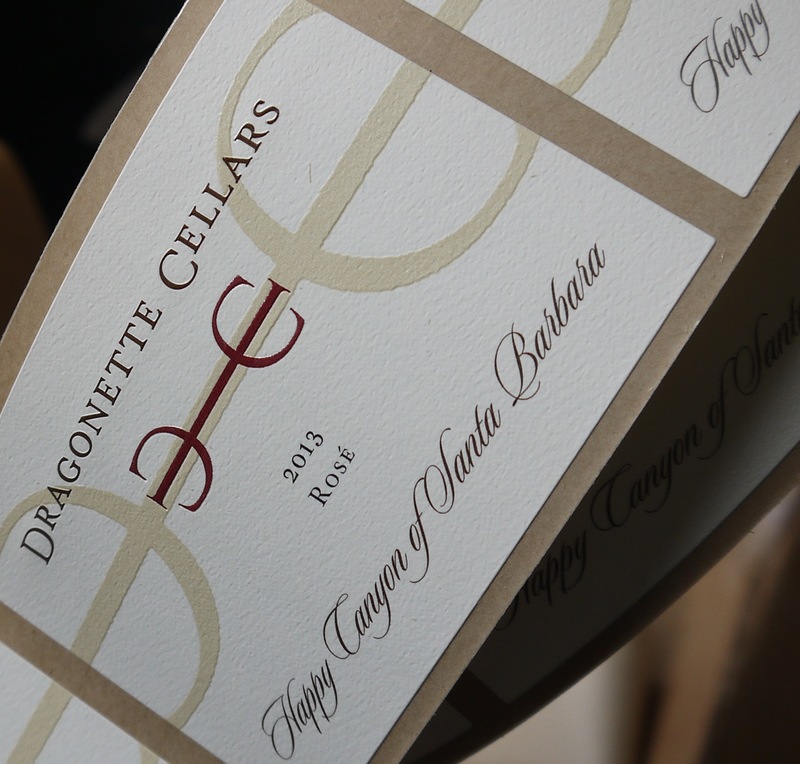 “This wine is a southern French inspired blend of grenache and mourvedre, specially farmed for rosé at the Vogelzang Vineyard,” according to http://www.dragonettecellars.com. 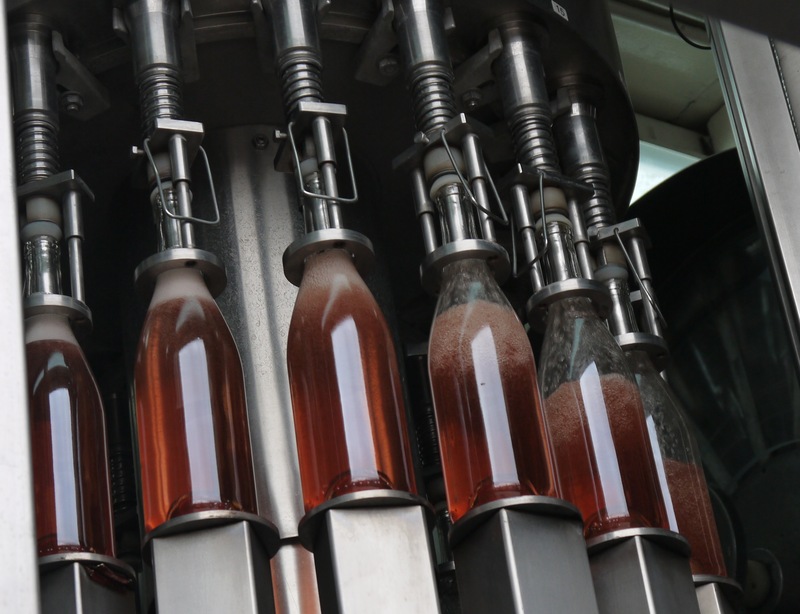 At 7:30 a.m. on Wednesday, Feb. 26, Brandon Sparks-Gillis, Steve Dragonette, Jen Hart, Jessica Gasca (national sales director) and small crew of friends starting bottling several new releases, this rosé among them. 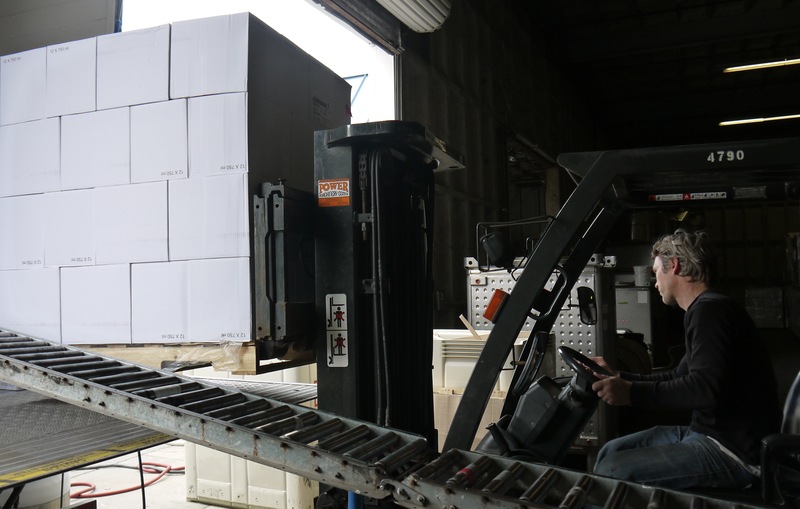 I stood in the shadows of the winery, watching and listening to the mesmerizing “clink-clink” of empty glass as Sparks-Gillis stacked case after case of bottles onto the belt. At the end of the bottling line, Gasca labeled and date stamped each full case. 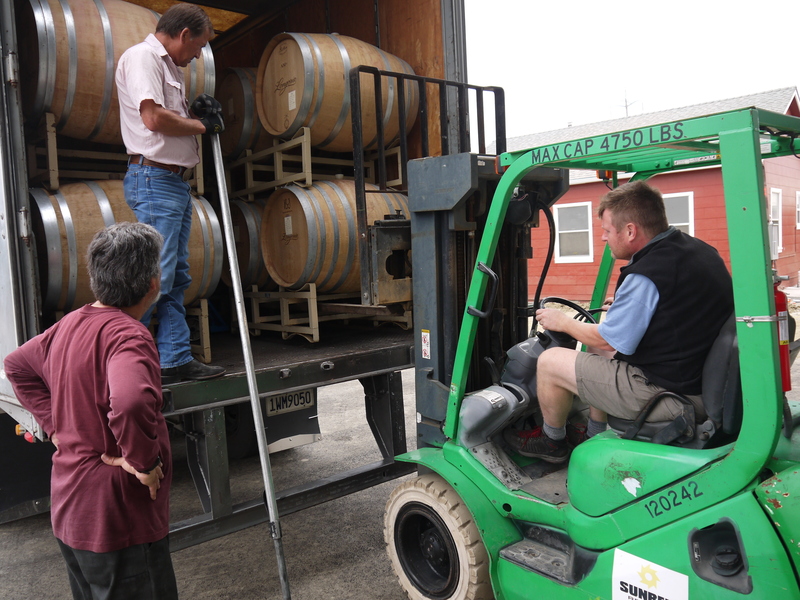 The crew also bottled about 300 cases of the 2012 Vogelzang Vineyard Sauvignon Blanc; 60 cases of Dragonette’s second rosé — the 2013 Sta. 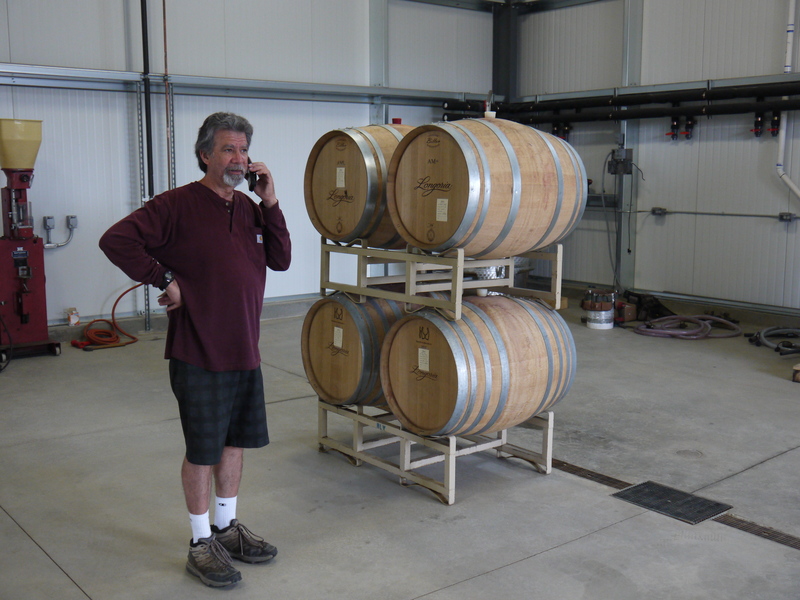 Rita Hills Pinot Noir — and two of the 2012 pinot noirs — roughly 425 cases from Fiddlestix Vineyard, and 175 cases of the Sta. Rita Hills, “Black Label,” Steve Dragonette told me. Last in the “East to West” series will be a trip back to Lindley Wines when Frankie and Jake bottle some of their new releases. The recent news that the popular Chardonnay Symposium would no longer be held in Chardonnay-ville, aka the Santa Maria Valley, now makes a little more sense. In a news release Tuesday, the Santa Maria Valley Wine Country Association, founder in 2010 of the Chardonnay Symposium, announced that it will dissolve, and has handed over ownership of the annual event to the Dolphin Bay Resort and Spa in Pismo Beach. The SMVWCA plans to give its “website and collaterals” to the Santa Maria Valley Chamber of Commerce, publicist Sao Anash (Muse Management) announced in a news release. Taking over for the association is a “think tank” of industry volunteers, who will promote the Santa Maria Valley in ways that “are not hemmed in by the restrictions associated with many advocacy group models,” said volunteer member Dayna Hammell. The Santa Maria Valley was recognized as an American Viticultural Area in 1981, making it Santa Barbara County’s first appellation. Among the members of the think tank are Nicholas Miller (Bien Nacido Vineyards); vineyard manager Jim Stollberg (Maverick Farming Company); winemaker James Ontiveros (Alta Maria and Native 9); Matt Murphy (Presqu’ile); Katy Westgaard (Presqu’ile Winery); Laura Booras (Riverbench), winemaker Clarissa Nagy (Nagy Wines); Dayna Hammell (Thornhill Companies); winemaker Paul Lato and Anash. Some updates on The Chardonnay Symposium have been posted via Facebook: http://www.thechardonnaysymposium.com. A full schedule of events and ticket information is expected to be announced in the coming weeks. 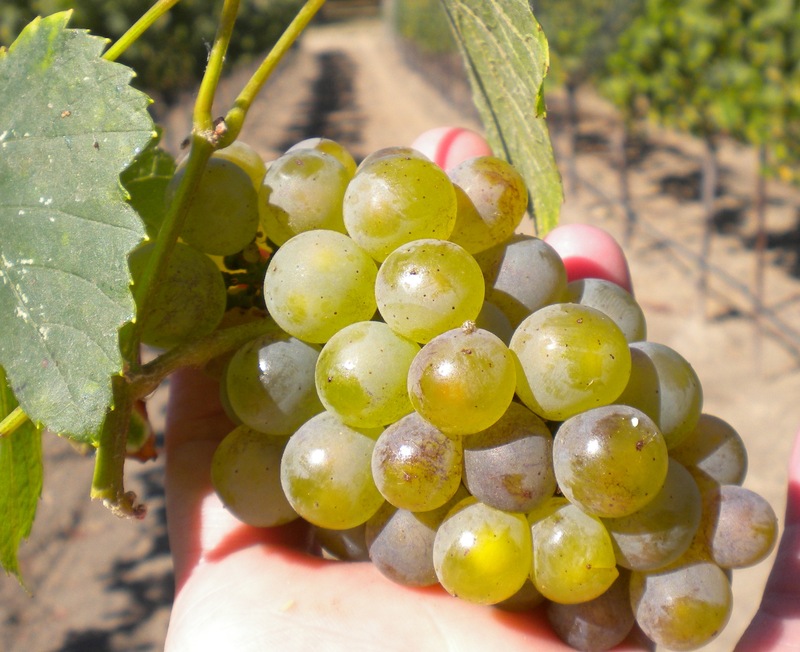 After debuting in the Santa Maria Valley in 2010, the Chardonnay Symposium will relocate to San Luis Obispo County for its fifth year, organizers have announced. The event will take place May 16 through 18 at the Dolphin Bay Resort & Spa in Pismo Beach. The symposium unites winemakers, sommeliers and food and wine enthusiasts to taste and learn more about “America’s Sweetheart” grape, which is grown throughout Santa Barbara County, especially in the Sta. Rita Hills and Santa Maria Valley. The Dolphin Bay Resort and the Cliffs Resort had long been host sites for the World of Pinot Noir (WOPN), but last year organizers of the popular pinot noir event relocated it to the Bacara Resort & Spa north of Santa Barbara. Dear Harvest: I know you’re out there . 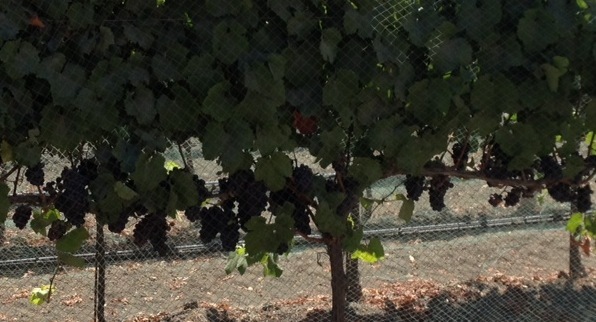 . .
Pinot noir ripening on netted vines at Kessler-Haak Vineyard in the Sta. Rita Hills on Aug. 9. On my way to work in Solvang this morning, I passed a truck pulling a trailer containing one bin of red grapes, headed west into Lompoc. I’m pretty sure I recognized the truck as one belonging to a Lompoc Ghetto-based winemaker. I’m guessing said winemaker was making a grape delivery of either pinot noir or syrah grapes to a winery, his or someone else’s site, and that the grapes were picked this early because they’re destined for sparkling wine. Just my guess. In the eight years since I first focused my eyes and ears on all things wine, I’ve sensed a shift in the atmosphere every August. Winemakers and vineyard managers spend more time strolling down rows of grapevines, testing grapes’ brix levels at the same time they’re testing the air for temperature and wind speed. They stare up at the sky. Every day, another of the zillion or so vineyards I pass on my daily commute gets nets flung over its vines. Another day, another netting. (Netting vines is super hard work, just so you know). So many unknowns go into the execution of an actual grape harvest that it’s a wonder thousands take place daily in these parts. First off, there’s weather to consider — especially heat and … R-A-I-N. (Shush! I didn’t even say the would out loud). There’s equipment: Picking, transportation and storage. Don’t forgot your gloves and plenty of water. Do we have enough clippers for everyone? Hats? Did I mention water? Will someone please bring some sunscreen … I hear it’s going to be a beautiful morning, out in the vineyard under sunny skies. We’ll be serenaded by song birds — oh, wait. Those will be the hungry swallows, angry that We. Got. Here. First. This is my love letter to the coming harvest, because it’s just around the next turn, you know. Morgen McLaughlin has been hired as the new executive director of the Santa Barbara County Vintners’ Association effective April 19 — the day before the organization’s annual Vintners’ Festival in Solvang. McLaughlin comes to Santa Barbara County from the Finger Lakes Wine Country Tourism Marketing Association, a regional tourism marketing group in Corning, N.Y., said Kurt Ammann, president of the SBCVA board of directors. McLaughlin replaces longtime executive director Jim Fiolek, who resigned earlier this year. The SBCVA’s board of directors is “confident and excited to have Morgan joining the team,” said Ammann, general manager of Dierberg Starlane Vineyards. Since 2007, McLaughlin served as president and CEO of the New York association. From 1994 to 2006, she co-owned and managed a small winery and vineyard in Connecticut, where she supervised wine production, grape growing and marketing. The SBCVA news release notes that during her tenure at Finger Lakes Wine Country, McLaughlin increased the association’s revenues by more than 50 percent, created integrated tourism and wine marketing campaigns and generated significant media coverage for the Finger Lakes region. McLaughlin earned bachelors of arts degrees in English and secondary education from Boston College. Ammann said that McLaughlin will relocate to Santa Barbara County with her husband and three sons by June 30. In the interim, following the Vintners’ Festival, she will meet with various member wineries, grape growers and other industry professionals during the weeks of April 21-27, May 16-23 and June 20-27.